The Relevance of the Research on the Psychosocial Dimensions of Aging Is Really the Same in Europe and USA? The paper by Kirilov and Coll. [1Kirilov I, Atzeni M, Perra A, Moro D, Carta MG. Active aging and elderly’s quality of life: Comparing the impact on literature of projects funded by the European Union and USA. Clin Pract Epidemiol Ment Health 2018; 14: 1-5. [http://dx.doi.org/10.2174/1745017901814010001] [PMID: 29492097] ] has the merit of focusing on a strongly critical general theme: the weight given to the results of literature in Europe and the USA. The importance of the article is still increased by the fact that it examines the specific theme of active aging, a fundamental theme, especially for Europe, given the demographic trends of the old continent [2 United Nations. World Urbanization Prospects 2014. Available from: https:// esa.un.org/ unpd/wup/ Publications /Files/ WUP2014-Highlights.pdf, 3Bramanti A, D’Aloja E, Cabras F, et al. The Elderly and the city: Lack of knowledge on violence perception and consequences on daily life. Clin Pract Epidemiol Ment Health 2018; 14: 46-52. [http://dx.doi.org/10.2174/1745017901814010046] [PMID: 29541151] ]. The fact that the subject matter is everywhere relevant, but somewhat more critical in Europe, would mean an imbalance of interest between the two countries. However, the results of the research reassure us: apparently, the projects financed with public money in Europe and in the US have the same impact in the literature. We used the term “reassuring” as Europeans because, on the contrary, Europe, and even more after the 'Brexit', could, in some respects, appear less competitive. much greater weight of American research compared to the European one [7Mura G, Carta MG. Physical activity in depressed elderly. A systematic review. Clin Pract Epidemiol Ment Health 2013; 9: 125-35. [http://dx.doi.org/10.2174/1745017901309010125] [PMID: 24009640] -10Agabio R, Trincas G, Floris F, Mura G, Sancassiani F, Angermeyer MC. 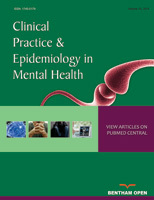 A systematic review of school-based alcohol and other drug prevention programs. Clin Pract Epidemiol Ment Health 2015 Feb 26; 11(Suppl 1 M6): 102-12. [http://dx.doi.org/10.2174/1745017901511010102] ]. Indeed, the same authors pointed out that while in the US' projects it is mandatory to bring into view the source of funding on possible publications, this aspect is not equally emphasized in European projects. This, by itself, is already an indicator of less attention paid to the impact of the publications. Despite the merits of the Kirilov et al.’s article, there is a limit that should be overcome by future research: the paper does not report the amount of funding. The Horizon / FP7 calls do finance projects on average larger than NIH. If there were any disparities in the funds collected, even with the same number of papers published, this would not show an equal impact between the two shores of the Atlantic. This hypothesis must be verified. SCIMAGO. https://www.scimagojr.com retrieved September 21, 2018.